Learn about the challenges patients face and strategies to ensure they get the nutrients they need for a healthy pregnancy and baby. Eight months before Paula became pregnant, she decided to become a vegetarian. She was 70 lbs overweight and believed that cutting out red meat, poultry, and fish, and eating only plant-based foods would help her lose weight and obtain better health. When Paula was diagnosed with gestational diabetes mellitus (GDM) in her 26th week of pregnancy, she continued eating a vegetarian diet to increase her chances of having a healthy pregnancy and baby. Emerging research continues to show the benefits of plant-based diets in the prevention and management of chronic disease. The Academy of Nutrition and Dietetics (the Academy) and other healthcare organizations state that a plant-based diet, including a well-planned vegetarian diet, is appropriate for individuals during all stages of the life cycle, including pregnancy. Studies indicate vegetarians have lower LDL cholesterol levels and blood pressure, and decreased rates of hypertension and type 2 diabetes than nonvegetarians.1 Plant-based diets tend to be higher in whole grains, legumes, nuts, fruits, and vegetables1—foods that are rich in dietary fiber, magnesium, potassium, vitamins C and E, folate, carotenoids, flavonoids, and other phytochemicals associated with low disease risk. However, when pregnant women, especially those diagnosed with GDM, eat a strictly plant-based diet they face the risk of developing nutrient deficiencies that may hinder their chances of sustaining a healthy pregnancy and delivering a healthy baby. The incidence of GDM is on the rise in the United States, and it currently affects approximately 7% of all pregnancies.2 Fueled by the ongoing obesity epidemic along with new diagnostic criteria, experts anticipate the number to increase to 18%.3 As a result, dietitians can expect to counsel more women with GDM. According to the American Diabetes Association (ADA), the ongoing obesity epidemic has led to more type 2 diabetes diagnoses in general and an increase in the number of pregnant women with undiagnosed type 2 diabetes. Because of this, the ADA recommends screening women who have risk factors for the disease at their initial prenatal visit using standard diagnostic criteria. Since a plant-based diet doesn’t include meat, fowl, or seafood, or products containing those foods, one challenge for dietitians working with vegetarian GDM patients involves developing nutrition plans that address the diverse types and eating patterns of a vegetarian. Evidence-based analyses of available studies also indicate that pregnant vegetarians eat less protein and higher levels of carbohydrate than pregnant nonvegetarians. The Institute of Medicine recommends 175 g of carbohydrate per day during pregnancy.3 During the last trimester, pregnant women require additional carbohydrates to ensure adequate glucose for the developing fetal brain. Eating a diet high in carbohydrates, however, is especially problematic for pregnant GDM patients who need to control blood glucose levels. Medical nutrition therapy (MNT) with an emphasis on controlling carbohydrate intake in GDM patients is considered first-line therapy and often the only therapy that will normalize blood glucose levels in women with GDM.3 Because vegetarian diets emphasize fruits, vegetables, beans, and whole grains, they’re inherently high in carbohydrates. Most vegetarians believe they can eat plenty of corn, peas, potatoes, and yams,7 but these are starchy vegetables and must be eaten in moderation. In GDM meal planning, these starches count as one carbohydrate and one protein serving, providing 15 g of carbohydrate and 7 g of protein. Gaining glycemic control quickly is essential to preventing complications associated with GDM, so it’s important for dietitians to carefully counsel mothers and develop meal plans that fit their unique lifestyles. RDs also must consider that the first meal of the day is physiologically the meal that GDM patients show the greatest insulin resistance. As a result, dietitians will need to limit these patients’ carbohydrate intake to no more than 30 g at breakfast. In addition, they’ll need to space carbohydrate intake throughout the day among three small- to moderate-size meals and two to four snacks. The Academy suggests GDM patients get 15 to 30 g of carbohydrate for breakfast, 45 to 60 g for lunch and dinner, and 15 to 30 g for snacks. Dietitians also should advise pregnant women with GDM to self-monitor fasting and postprandial blood glucose levels. Several studies report a correlation between elevated fasting and postprandial blood glucose values with poor maternal and neonatal outcomes. Traditionally, women who have been unable to achieve and maintain normal blood glucose levels with MNT alone have been prescribed insulin. However, recently doctors have been prescribing glyburide and metformin to GDM patients, although the FDA hasn’t approved either of these medications to treat gestational diabetes. Glyburide is the only antiglycemic medication that’s been well studied in pregnant women. According to the Academy’s Evidence Analysis Library, eight studies reported that glyburide was effective in maintaining glycemic control with MNT. While advances in medicine have improved the treatment of GDM, no one wants such a diagnosis. And although it may be for only a matter of months, making lifestyle changes during pregnancy can be stressful. Compounding the problem is the increase of hormones that work against insulin and can cause blood glucose levels to rise. Mothers may feel guilty and embarrassed if they’re overweight and know their eating habits are less than ideal. Sarah Krieger, MPH, RD, LD/N, an Academy spokesperson and a facilitator for the Fit4AllMoms Study at All Children’s Hospital in St Petersburg, Florida, accentuates the positive with her patients and tells them this is a perfect time to begin a healthful lifestyle, increase physical activity, and avoid gaining too much weight. Others may be fearful of the prospect of injecting insulin and may withhold or manipulate data in their self-monitoring of blood glucose log or reduce food intake to control hyperglycemia. Some women may become angry about having to change their lifestyle and begin paying attention to food intake, carbohydrate counting, blood glucose monitoring, and insulin injections, if required. Dietitians should acknowledge that GDM can be overwhelming. “I justify that first,” Krieger says. Emotional support and education on GDM will ease women’s fears and can serve as a source of motivation. “When they understand they don’t want a large baby or C-section, moms are motivated to follow through by following recommendations,” she says. Krieger advises dietitians to develop a good working relationship with each patient’s doctor and understand what he or she is telling the patient. “I work in a practice with six different doctors, and they all don’t tell the patients the same thing,” she adds. As mentioned, research supports that a well-planned plant-based diet is appropriate during all stages of life, including pregnancy. However, the inherently high carbohydrate content of a vegetarian meal plan coupled with the emotional stress of GDM can be challenging to both the mom-to-be and the dietitian. By educating patients about GDM and walking them through the process of choosing nutritious foods and taking the proper prenatal supplements to meet nutrient requirements, pregnant women with GDM can expect to have a healthy pregnancy and baby. • Weight loss during pregnancy isn’t recommended. Research indicates that low or inadequate weight gain during pregnancy is associated with an increased risk of preterm delivery, regardless of prepregnancy BMI levels. However, a modest energy restriction—approximately 70% of the Dietary Reference Intake (DRI) for pregnant women—will promote a slowing of maternal weight gain. A minimum of 1,700 to 1,800 kcal/day should be obtained to prevent maternal or fetal compromise or ketonuria. • Based on the DRI, a minimum of 175 g of carbohydrate per day is encouraged to provide adequate glucose for fetal brain development and prevent ketosis. Total carbohydrate intake should be less than 45% of total calories to prevent hyperglycemia. Elevated postprandial blood glucose levels are associated with large-for-gestational-age infants and increased rates of C-sections. • Protein and fat should be calculated to provide 10% to 35% and 20% to 35% of the DRI for energy, respectively. The Recommended Dietary Allowance for pregnancy is 1.1 g/kg of protein per day, or an additional 25 g of protein per day. • If women with GDM choose to use products containing nonnutritive sweeteners, dietitians should inform these women that they should consume only FDA-approved nonnutritive sweeteners and suuggest they use them in moderation. Aspartame, acesulfame potassium, sucralose, saccharin, and neotame are FDA approved for general use. This menu was developed based on an intake of 195 g of carbohydrate, including nine servings from the starch group, two servings from the fruit group, and two servings of meat substitutes. 1. Craig WJ, Mangels AR; American Dietetic Association. 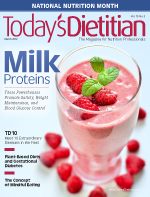 Position of the American Dietetic Association: vegetarian diets. J Am Diet Assoc. 2009;109(7):1266-1282. 2. Screening and diagnosis of gestational diabetes mellitus. The American Congress of Obstetricians and Gynecologists website. http://www.acog.org/Resources_And_Publications/Committee_Opinions/Committee_on_Obstetric_Practice/Screening_and_Diagnosis_of_Gestational_Diabetes_Mellitus. September 2011. Accessed December 27, 2012. 3. Gestational diabetes. Academy of Nutrition and Dietetics Nutrition Care Manual website. http://nutritioncaremanual.org/content.cfm?ncm_content_id=80752. Accessed December 10, 2012. 4. American Diabetes Association. Standards of medical care in diabetes—2012. Diabetes Care. 2012;35 Suppl 1:S11-S63. 5. Vegetarianism in America. Vegetarian Times website. http://www.vegetariantimes.com/article/vegetarianism-in-america/. Accessed December 10, 2012. 6. Vegetarian nutrition. Academy of Nutrition and Dietetics Evidence Analysis Library website. http://andevidencelibrary.com/conclusion.cfm?conclusion_statement_id=250871. Accessed December 10, 2012. 7. Chatterjee S. Use of a vegetarian diet in gestational diabetes. Vegetarian Nutrition Update. 2012;20(4):1-7. 8. GDM: MNT for pregnant women with IGT or GDM. Academy of Nutrition and Dietetics Evidence Analysis Library website. http://andevidencelibrary.com/template.cfm?template=guide_summary&key=2204. Accessed January 21, 2013. 9. Executive summary of recommendations: Academy of Nutrition and Dietetics gestational diabetes mellitus evidence-based nutrition practice guideline. Academy of Nutrition and Dietetics Evidence Analysis Library website. http://andevidencelibrary.com/topic.cfm?cat=3731. Accessed December 27, 2012. 10. GDM: pharmacological therapy for treatment of GDM. Academy of Nutrition and Dietetics Evidence Analysis Library website. http://andevidencelibrary.com/template.cfm?template-guide summary&key=2174. Accessed January 21, 2013.